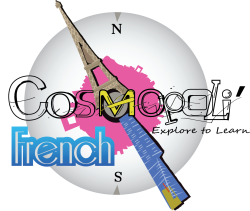 At Cosmopoli’French we do not believe you can just take a French lesson to learn a language. We believe you must experience life fully ensconced in the culture to absorb and understand what French is all about. Fromage: A French word that is known internationally and that conjures up pictures of picnics by the Seine with crusty baguettes, cheese and wine. Romantic, perhaps, but a true experience one should be able to enjoy. We offer experiences that help transport you to this world so that you can truly emerge yourself in French culture in order to better appreciate and embrace the language. Events such as Cheese for Bastille Day offers an engaging interaction with a celebrated “fromager” introducing you to an authentic Art de le table as part of your full French cultural experience. This is one example of the types of events we prepare as part of our approach to enhanced learning. Not only do we bring you into the life of the French, we bring French into your life. Your everyday efforts may include Yoga, so we take this opportunity to include Yoga as part of our approach to teaching. You can participate in a class that introduces and reviews the French words for body-related words with a relaxing yoga experience to wind you down at the end of the class. Relating to everyday stresses in your life brings a new way of learning to help send stress away. Carrying on and planning these types of interactive events allows us to keep you engaged and interested in further developing your French language skills. We believe that learning a language is assisted when learning the culture or by bringing the language into terms you may better understand when introduced into your own daily life. We invite you to keep watch of upcoming events and welcome your participation and questions.